Pip & Pear Chilled Baby Food has launched their new Toddler Range into Aldi supermarkets. 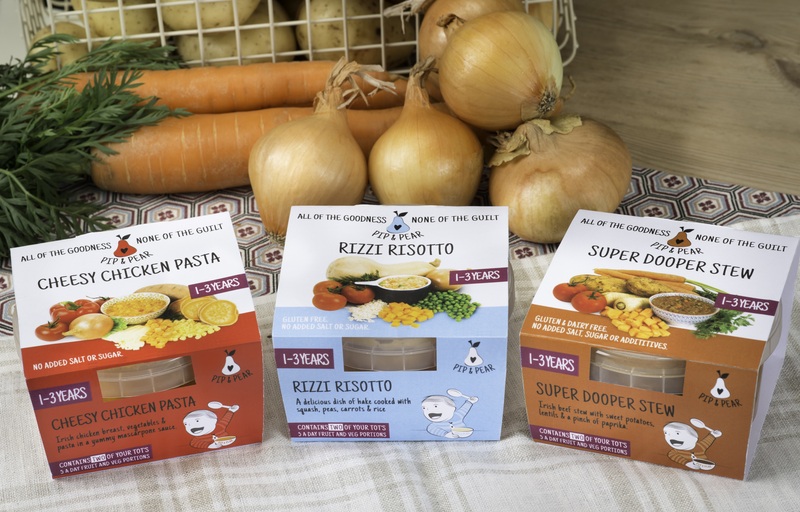 The Culinary Food Group has developed a strong relationship with Pip & Pear and are really excited to be manufacturing this new toddler range of food products. Pip & Pear’s new toddler range caters for little ones from one to three years and each meal is filled with the highest quality ingredients, delicious flavours and chunky textures – the kind of meal you’d expect to get from home cooking. These nutritious and convenient meals are available to parents for the first time and the range is now stocked in the dairy fridge of Aldi supermarkets. The new range was launched at the first Baby and Toddler Pop Up Restaurant in aid of BUMBLEance Children’s Charity during the Waterford Harvest Festival where it received a tremendous response from toddlers and time pressed parents! Irene of Pip & Pear said that “the reaction to our new Toddler Range has been fantastic, parents and toddlers from all over visited our wonderful Baby and Toddler Pop Up Restaurant and were eager to taste the new dishes. These parents are thrilled to find a nutritious and tasty alternative to their own home cooking”. Pip & Pear Chilled Baby Food is a revolutionary baby & toddler food range which was conceived in the kitchen of Waterford mum and restauranteur Irene Queally. Irene has sourced top quality ingredients including Organic Fruit and Vegetables, Organic Gluten Free Baby Pasta and Bord Bia Approved Irish Beef, Lamb and Chicken. Using Irene’s home cooked recipes and containing up to 2 of your tot’s 5 a day fruit and veg portions; the tasty range offers parents “the next best thing to homemade, with all of the goodness and none of the guilt”. Speaking on the move into the toddler market, Irene explains “We received countless requests from time-pressed parents looking for a range for their older babies and toddlers. We soon began to carry out research, doing online surveys with parents and focus groups in order to completely understand the toddler market and to ensure that we offer a range that is exactly what parents are looking for”. The Pip & Pear range is available in the dairy fridge of Aldi supermarkets nationwide and selected SuperValu stores. The Culinary Food Group are strong believers in innovation and invest heavily in this area. Our purpose built Innovation Centre is where the magic happens! The centre supports all four of the food businesses and provides a first class facility for product development. The Innovation Centre allows us meet any spec. or requirement for the retail, food manufacturing or food service industries. Why not take a look through our brochures to learn more and contact us if you need additional information.